Scout with Science! 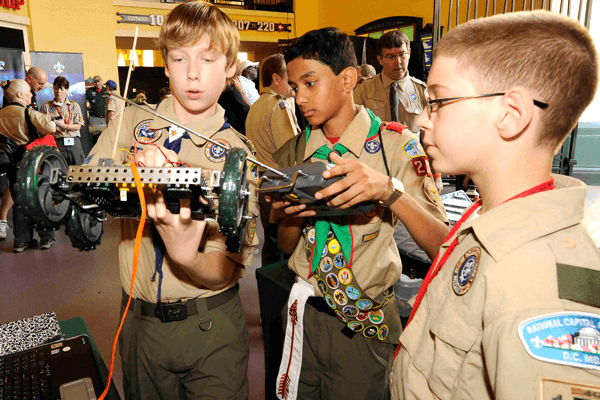 We offer unique learning workshops to meet specific requirements for Girl Scouts, Cub Scouts, and Boy Scouts. Our exclusive Overnight Adventures give your troop or pack exciting after-dark museum experiences. Or, work with our Education team to craft a custom Scout experience! Explore constellations, rockets, and astronomy careers. Meets all requirements for “Sky is the Limit”, a Tiger Elective Adventure. Each adventure offers exciting introductions to the world of science. The scientific method, dinosaurs, germs, and fossils—get ready to Do Science! Interested in a custom experience? Contact our Scout Programs Coordinator at 502-560-7156. Discover how robotics have advanced industry and safety as you design, program, test, and build your own robot. Travel the Universe, learn about space exploration, solve real-world problems and practice the skills utilized by astronauts, scientists, and engineers—all without leaving Louisville! Work as a team to land on the Martian surface and seek out evidence of life and water while locating missing satellites, checking radiation levels, and design and build a Martian Habitat.